have an international nursing qualification equivalent to that prescribed in New Zealand are competent to practise within their scope of practice are fit for registration, which includes the ability to communicate effectively in English for the purpose of practicing nursing. International applicants from all countries (except Australia) are required to sit an English Language assessment before submitting an application. To assist overseas nurses to adapt to the expectations and culture of NZ nursing curriculum and workplace. The ESNR programme was specially designed to assist overseas qualified nurses to achieve an IELTS score of 7.0 OR a 'B' pass in all four skill areas of Listening, Reading, Writing and Speaking. Option B is the Intensive OET Preparation course. Learners can choose the option they would like to study based on the test they intend to take. Working in NZ – Seminars and Workshops: The second component of the programme is designed to introduce nurses to New Zealand health industry, living in New Zealand and workplace culture. Nurses would also be taught how to write a CV, search for jobs, apply for jobs and attend an interview. After completing this course, nurses will be assisted by WIE’s job recruitment partners to obtain part-time work* of up to 20 hours per week. IELTS (Academic Test) score of 6.0 across all bands. This programme is designed for qualified nurses that do not fulfill the IELTS 6.0 requirement for the ESNR programme. Upon completion of the Pre-ESNR programme, learners will be promoted to the ESNR programme. This component of the programme consists of two options. Option A is the Intensive IELTS Preparation course and Option B is the Intensive OET Preparation course.. Learners can choose the option they would like to study based on the test they intend to take. IELTS (Academic Test) score of 5.0 across all bands. All learners enrolled in the Pre-ESNR and ESNR programmes will be provided with a FREE User Licence to access either the Computer-based IELTS Preparation course OR the Computer-based English for Health course for the duration of their study. 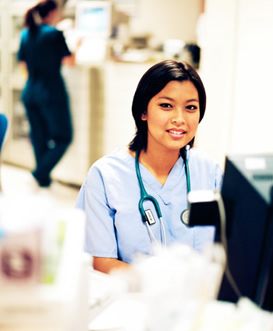 The Computer-based IELTS Preparation and English for Health courses are offered exclusively to WIE’s nursing students in addition to classroom-based learning. With this computer-based study system, learners can study at their own pace to either speed up their learning or improve their current level. * Note: Requires approval by Immigration New Zealand.